Cleans nooks & crannies. Click on image for more information. Cut cleaning time to seconds. Click on image for more information. Central vacuum muffler click on image for more information. 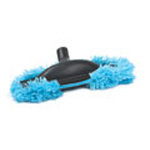 Reduces odors, maintains and revitalizes your entire central vacuum system. Click on image for more information. Dust mop attachment. Click on image for more information.